CALLING ALL 4TH GRADERS! 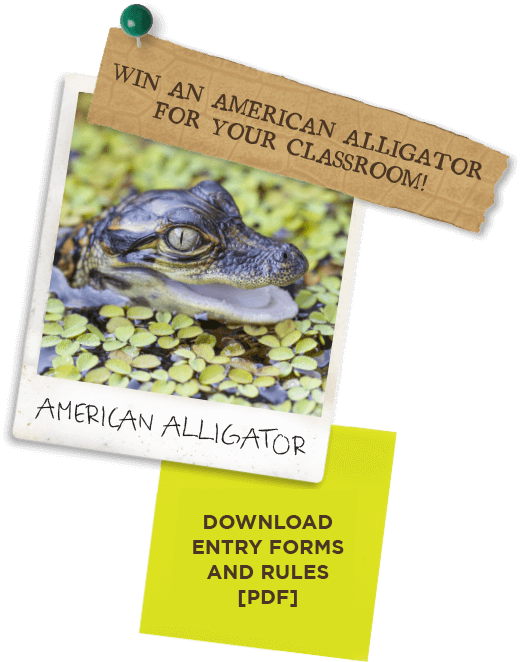 WIN AN AMERICAN ALLIGATOR FOR YOUR CLASSROOM! The Edu-Gator contest gives fourth grade students in St John’s county an opportunity to win a REAL LIVE AMERICAN ALLIGATOR for their classroom. The class that receives the prize will have a once in a lifetime chance to be up-close and personal with these often misunderstood animals. The contest is designed to engage students with science and encourage them to be creative with their entries. Students will need to select a Native Florida reptile and discuss the positive or negative impacts humans have had on this species. Please then tell us how you and your school can make a positive change to aid in their overall conservation? Please click here to download official rules, poster and entry form. GOOD LUCK!! !